We are mid-way through November and this is my first post! Sorry ladies, but my nails chipped and my 6 years old Macbook Pro cracked so I haven't been too motivated to write on my broken laptop. It still functions, which is why I'm still able to create this post. It is just a little bit annoying since I have this giant black dead pixel spot. Dumb move on my part since I watched a movie in bed and left my computer near the edge where it fell. But I'm going to be positive and take it as a sign that it's time for an upgrade, especially to the gorgeous new iMac that's coming out! Anyways, this is going to be hurting my wallet this month. Maybe it's time to start selling my nail art too... would you buy it? So here's an extra intricate and time consuming nail art for your viewing pleasure. This nail art is inspired by a dress in Erdem Pre-Fall 2012 collection. This is my second Erdem inspired nail art, the first one being the dress that Emma Watson wore at her TIFF primiere. I love how feminine his clothes are so I immediately gravitated towards his collection when viewing for inspiration. I also really wanted to use a neutral color like brown since I feel like it's such an underrated nail color. Autumn is definitely a good time to wear browns and darks. For tutorial, keep on reading! What tools do you use to create this look? Normally I would use my pointer and middle finger in my tutorials, but I chipped my middle finger nail! Paint your nail with Vera until it is opaque and dry. 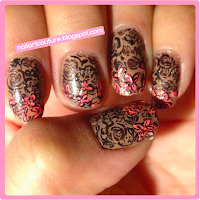 Next, using your Konad Stamping kit with Konad Special black nail polish, transfer the rose image onto your nail. There will be a lot of negative space; ¾ of the design needs to be filled since the tip will be filled with another design. Using Brandt nail polish and a nail art brush, create petals, leaves, and swirls until you are satisfied with it. If you make a mistake, simple paint over your mistake with Vera. Using Sasha, create outlines of flower petals, swirls, and leaves near the tip of your fingernail. This should take about 1/3 of your nail. Fill in your design with Natalie. Give your floral design some highlight. Using Lynn, outline part of the border of the flowers. Using Brandt, outline the entire floral design and add some indentation of the petal. The black outline will make your pink floral design look cleaner. Gorgeous! Love the pop of color with the neutral! ahh another gorgeous creation! great job samantha! That would be the most amazing perk ever!! Or front row seat at their fashion show would suffice lol I hope to be as successful as Miss Lady Finger. i thinks is very difficult no?